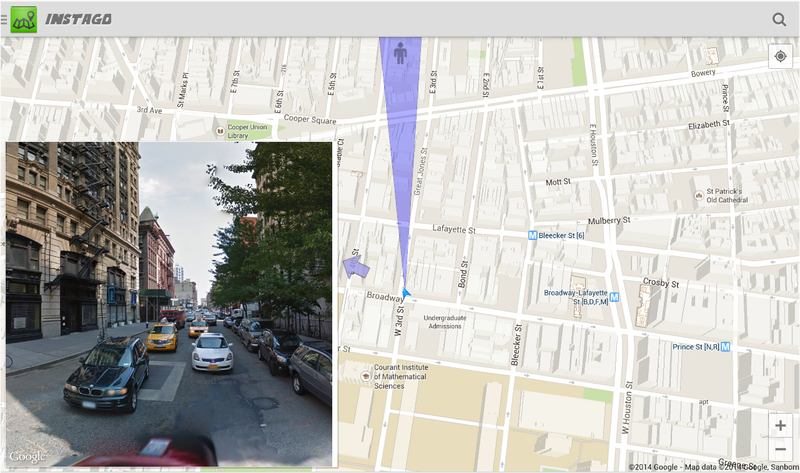 Instago Map Street View holds true to its name, and takes two things that Google does well, and puts them in front of you simultaneously. The GPS built into Android devices is only as good as the software that accesses it, and whether you use Google Maps or not, replacements for Google Maps’ Street View function is not as easy to replicate. Developer Theredsunrise recognized the awesome potential of viewing a Google Map and Google Street View at the same time, and created Instago. The concept of Instago is simple- pick a point, and the application will show you an arrow on how to get there. Along the way, the application will also show you a map (you can choose your map type), and the street view as you make your journey. However, the application will not show you directions or a line on how to get there, just the point you have chosen, and the pin to mark it. It is interesting and helpful watching the map and street view adjust in accordance with your GPS along the way, and the application a slick augmented reality feel to it. There are some limitations in the application, that will hopefully be addressed in future updates. You are unable to search for landmarks, and are limited to either manually dropping a pin on the map, or entering an address. If you know your address, or are trying to return to a point you were previously at (like a parking spot at an arena), this application is useful, but its use as a navigation assistant is limited. It will be great to see how this application continues to develop, but in the mean time it is one worth checking out. The post Instago Map Street View: A simple app with great potential appeared first on AndroidGuys.